Legally defined water rights at heart of Basin solution; Arriving at a good agreement also requires strong values, vision and fair treatment, by Steve Harper, 12/6/09. "Harper was commander of Kingsley Field from 1984 to 1993. He was also executive vice president of the Klamath County Chamber of Commerce and served two terms as a state representative and one as a state senator. He owns and operates with his son..."
Sink the pork laden (Calif) water bond, Press Enterprise by Assemblyman Jeff Miller, posted to KBC 11/30/09. "..$250 million for dam removal on the Klamath River. That's right: removal, not construction...the Capitol reverted back to many of its troubling habits of secret deal-cutting and last-minute changes to seemingly settled legislation. Sometimes, we fundamentally forget to make certain that we have asked for -- and received -- the consent of the governed." Keep up the voice of the people (Klamath), Pioneer Press, posted to KBC 11/30/09. "... the general public gave our opinions and support of our supervisors to not sign the Klamath Basin Restoration Act...Another gentlemen from Klamath Falls, Ore. presented a very good speech, but also stated they had a meeting in Klamath Falls where 350 people showed up who all voted no on the dam removal. He said there is only a special interest group up there supporting the removal of our dams." Oral and written testimony by James Ottoman, Klamath Falls, to the Southern Oregon legislative delegation who hosted the public input forum on 11/10/09 regarding the Klamath Basin Restoration Agreement and Klamath dam removal. Why not use water rights funds for storage instead? H&N letter to editor by Jim McAtee, Klamath Falls, posted to KBC 11/16/09. KBC NOTE: At the public hearing on 11/10/09 that Klamath County Commissioners and Klamath Water Users boycotted,, we learned that if Long Lake or any off-stream water storage is developed, it may not be used by agriculture but only put in the Klamath River for fish. Your representatives agreed to this in the KBRA/Klamath Basin Restoration Agreement. * KMED audio interview with Off Project irrigators Tom Mallams and Larry Nicholson on Bill Meyer talk show about the Klamath Basin Restoration Agreement and how it will effect the Klamath Basin, Klamath River, and Rogue Valley. Who is paying Oregon Senator Jason Atkinson, who said "he endorsed the plan despite considerable opposition among many of his constituents." Was Klamath hydro dam removal a scientifically-sound option or an agenda-driven mandate? Who is paying Off Project rancher's wife who is at the negotiation table supposedly representing Off-Project irrigators who oppose her (in 2008 she denied the arrangement.) while Resource Conservancy is denied a seat. I Feel Offended, by Frank Goodson, Vice Chairman of the Klamath County Republican Central Committee, presented at the 11/10/09 public forum. "I FEEL OFFENDED…that the Klamath Basin Water Users Association accepted my personal and political support at the water brigade in 2001 but ." KBRA: Not even enough common concern for the two sides to meet?, H&N 11/15/09, and KBC Response: the H&N editorial is malicious slander. "They know the KBRA may cost their water rights and their way of life, and they know that the negotiators are making many trips to DC to form legislation to push their agenda through without hearing what the people want." Hundreds of Klamath farmers' and ranchers' attend public input KBRA meeting hosted by S. Oregon Legislators. Klamath Water Users Association, Klamath County Commissioners and PacifiCorp boycotted it. 11/11/09, by KBC News. "We're told we don't deserve a seat at the table. The key KBRA people won't come to hear us. The robbers don't usually want to hear the victims...The government is supposed to represent all of us, not just a select few." Remember everyone involved in dams fight, H&N letter by Robert Manasco, Los Molinos, Calif. "It appears to me that California is so ashamed of its support that it hides the $250 million in a Safe Drinking Water and Storage Act AB 752." Have You Had Enough Yet? by James Foley, Klamath River, Calif, Property and Mining Rights Advocate 10/8/09. Water for Life believes (Klamath) agreement process unfair, H&N letter by Bill Wilber, President Water for Life posted to KBC 11/6/09. Left high and dry in the Klamath Basin? by guest columnist James Huffman, Oregonian, posted to KBC 11/1/09. James Huffman is the Erskine Wood Sr. Professor of Law at Lewis & Clark Law School. "Roger Nicholson and his neighbors have vested water rights the agreement will likely obliterate, yet they were excluded from the negotiations." Don't be fooled, by Shasta Nation Tribal Council, Pioneer Press, posted to KBC 11/6/09 Klamath River Dam Removal, 10/30/09 - Column by Marcia Armstrong, Siskiyou County Supervisor District 5. Klamath Restoration agreement - two views: Roger Nicholson and Garrett Roseberry Against the agreement: It would devastate cattle industry, followed by Becky Hyde defending the agreement ? by Roger Nicholson, President of Resource Conservancy and Fort Klamath Critical Habitat Landowners, and Garrett Roseberry, Vice President of Resource Conservancy and Sprague River Water Resource Foundation, 10/25/09. HERE for Becky's Whose Who page. Resource Conservancy, representing 95% of Off Project, is denied a seat at the KBRA table and dam-removal table, however Hyde is at negotiation for OP. Why? 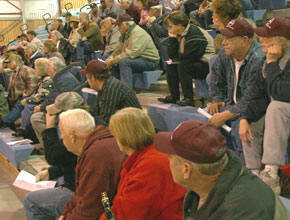 Hundreds of Klamath farmers' and ranchers' attend public meeting Boycotted by Klamath Water Users Association and Klamath County Commissioners concerning Klamath settlement agreement, 11/11/09, by KBC News. "We're told we don't deserve a seat at the table. The key KBRA people won't come to hear us. The robbers don't usually want to hear the victims...The government is supposed to represent all of us, not just a select few." Nothing is perfect, including Basin proposal, H&N letter by Ann Fairclo 9/15/09. " Whitsett, Garrard don’t deserve attacks over water, H&N letter by Edward Bartell 9/13/09. "I am troubled by the attacks on State Sen. Doug Whitsett, by Greg Addington, Klamath Water Users Association executive director, and Steve Kandra, a board member. It is monumentally ungrateful of them to smear the senator after he and Rep. Bill Garrard worked day and night to secure the roughly $20 million in rate shock protection for Klamath Basin irrigators....I find it hard to believe that it is sheer coincidence that Kandra’s cousin and fellow Klamath Water Users Association board member Karl Scronce, who I understand sold his off-Project farm, was one of the founders of this dissident (off-project) group." (Siskiyou County counsel) Guarino letter: Stop neglecting us in dam negotiations, Siskiyou Daily News, posted to KBC 9/7/09. “As you may or may not know, the position of the County of Siskiyou has been that it does not believe that there is sufficient information or scientific study to support a determination at this time that removal of the dams is appropriate. This bill presupposes that dam removal is the appropriate solution....These harms include loss of property values and property taxes, loss of recreational activities, loss of clean hydroelectric power, and increase in the costs of power for the ratepayers in the County, as well as environmental impacts and restoration mitigations for which adequate funding has yet to be identified." Is removing dams sensible when power water short? H&N letter by John Poorman, Lakeview 9/15/09 A note from Bob Davis, Siskiyou County, regarding the Klamath Basin Restoration Agreement, 9/7/09. "I am still waiting for someone to show the words that guarantee farmers water...."
Letter to editor H&N, "If the dams are gone, what will stop the flooding?" Bill Haugen 08/29, Klamath Falls, posted to KBC 9/7/09 Dam removal agreement almost finished, H&N, posted to KBC 9/5/09. Includes comments by KWUA, Karuk Tribe Craig Tucker, and PCFFA Glen Spain. More on Tucker and Spain. The status quo with dams won’t work, by Glen Spain and Craig Tucker, H&N Letter to the Editor 8/30/09. KBC response, "First, who is Craig Tucker? and Glen Spain?" Addington accuses Klamath's three elected state representatives of scheming and doing the wrong thing; the reps polled Klamath County to find out the will of their constituents regarding dam removal and the Klamath Restoration Agreement. KWUA has not polled the farmers and ranchers they claim to represent. Said Addington: "I believe ... the people in this county understand that the issues at hand aren’t that simple...If our legislators and others, on behalf of the “Republican Party” are successful in their opposition to this collaboration and the overall settlement, the likely result will be perpetuation of instability and damaging conflict...Does the Republican Party not support this company’s (PacifiCorp's) private property rights, and its ability to make sound business decisions?" Tony Intiso addresses the Scott Valley town hall about water rights and land use, the Klamath Basin Restoration Agreement, YouTube July 21, 2009. State lawmakers stand for what is right; Only 'split' in local GOP is a small group supporting dam removal, Tom Mallams, H&N 8/14/09. "As far as being threatened, manipulated or coerced into voting or agreeing in a certain way on dam removal and the restoration agreement endorsement: I truly believe that this is what is happening before our very eyes by those forcing this agenda down our throats. Those groups being some federal and state agencies, environmental groups, tribal groups and those irrigators who have thrown in the towel and given up on the principles that our founding fathers believed in when this great nation was formed." California assemblyman (Jim Nielsen): Dams should stay, Herald and News 8/9/09. " 'We should not be taking out dams. We need to be building dams,' said Nielsen, whose sprawling district includes Modoc and Siskiyou counties. 'I’ve taken a stand solidly with the county to retain the dams.' Three of the four dams proposed for removal as part of the proposed Klamath Basin Restoration Agreement are in Siskiyou County, where supervisors and others have loudly opposed removal'. It doesn’t make sense to demolish Klamath dams, by Cordy Starr, H&N 8/12/09. "A glaring lack of common sense is seen in the plan to destroy the four dams on the Klamath River. The secret meetings have excluded the public....We, the people of the Klamath Basin, have the right to have our voices heard in a vote or formal protest." * July 1 Dept. of Interior letter to Siskiyou County Board of Commissioners Chairman regarding dam removal negotiations, posted to KBC 8/6/09 Salmon will have to be retrained, Guest Opinion By Dan Rowe, MD, MBA, Carson City, Nev. Pioneer Press, posted to KBC 7/31/09. The Klamath Basin Restoration Agreement: many wolves and a sheep, Op-Ed by Marcia Armstrong, Siskiyou County Supervisor District 5, 6/16/09 Well, if you really want to restore things…H&N letter to editor by Dan Sullivan, Bonanza 6/16/09. KBC NOTE: HERE for agenda of a KBRA 'confidential' meeting where there is discussion of removing Link River and Keno dams. The ‘only’ Basin water plan is not a good one, by Frank Goodson, letter to editor H&N, posted to KBC 6/3/09 Republicans’ stand on KBRA disappointing, H&N Letter to the Editor June 3, 2009 by Belinda Stewart, Klamath Water Users Association Outreach and Project Coordinator, along with "Poll shows how people feel about dam removal" by Tom Mallams. Should biased polls guide public officials? by Dave Solem, Klamath Irrigation District manager, letter to H&N 5/31/09. KBC responds A time to choose: collaboration or conflict? by Klamath Tribal members, biologist, and attorney, H&N 5/31/09. KBC notes. Talent Irrigation District's loss of their 30,000 acre foot diversion, which includes the KBRA citation, 1/23/09. Senator Whitsett and Craig Tucker, "as the Agreement is currently written, then the water right, instream water right for the Klamath River, that would be transferred into the river, would be have a priority date considerably better than the Talent Irrigation District's diversions from Hyatt Lake and Howard Prairie, and I can't see how they couldn't have a call on that water." Restoration agreement is only plan in the works, by Patsy Gasser, H&N letter to editor, followed by comments from H&N website, 5/26/09. H&N reader comment: "The majority of citizen voters of all parties in Klamath County are opposed to the secretly derived KBRA and its primary component of dam removal. The Republican Central Committee has overwhelmingly voted to pass that information along to the few supporters of the KBRA. Many of the Central Committee that voted against the KBRA/dam removal are in fact KWUA members. Most KWUA farmers DO NOT support the agreement." PRESS RELEASE: Poll shows overwhelming opposition to Klamath River dam removal, Senator Doug Whitsett 5/14/09 Klamath Basin Restoration Agreement poll results, Senator Doug Whitsett Update 5/14/09. Comment of Channel 12's "reporting on the proposed Klamath Basin Restoration Agreement/KBRA, by Katherine Lehman, immediate past president People for the USA Grange 835. "If you had read the KBRA you would know THERE IS NO GUARANTEE OF ANY WATER TO ANY IRRIGATOR. The KBRA does, though, guarantee irrigators will lose water, and not just in the upper Klamath Basin." Letter to Governor Arnold Schwarzenegger from Anthony Intiso, Master Greenhorn Grange # 384, Yreka, opposing Klamath River Hydro Dam removal, 4/24/09. Intiso is also 2nd vice chair Siskiyou County Republican Central Committee. "The undersigned granges from over eleven counties state wide request you and the other elected and appointed officials who are receiving a copy of this letter support The Siskiyou County Board of Supervisors in their position of keeping the Hydroelectric dams." Environmental group pulls out of Klamath talks, Oregonian, KBC Response, posted to KBC 4/24/09, "...Since there were up to 30" of water on our fields, the US government issued war veterans, with WWI and WWII homesteads, deeds with water rights appurtenant to their land for 2.5 feet of water, the rest going into storage and the river. The feds and enviros want it all..." Water settlement process is flawed by Tom Mallams, H&N 4/22/09, President Klamath Off-Project Water Users Association. "Once again the corrupt process overpowers logic, common sense, and equitable participation. A small non-representative group being added to the Klamath settlement group is another example of how corrupt the dam removal and Klamath Basin Restoration Agreement group process continues to be." Response to 'Gimme a Break" from KBC to Karuk Spokesman Craig Tucker, 7/25/07 Siskiyou County Board of Supervisors 3/17/09 response to letter by Calif. Secretary of Natural Resources Mike Chrisman. "Why is the state of Calif. so willing to sacrifice the economic well-being of one of its counties, particularly in light of the current economics in the United States." Is dam removal really the best option? by Rex Cozzalio, Siskiyou Daily News, 2/3/09 Excerpt from Siskiyou County Supervisor Marcia Armstrong's opinion column on Yreka FERC meeting regarding dam removal Agreement In Principle 1/30/09.